This refined statuette-probably representing Manjusri, the “bodhisattva of wisdom”-adopts an elegantly swaying, triple flexion (tribhanga) pose highlighting the shape of the waist and thighs. With his right hand, the deity is making the symbolic gesture of reasoning (vitakamudra) with which he is associated, while his left hand holds the stem of a flower, nowadays missing. If the figure is indeed that of Manjusri, then the missing element would have been a blue lotus, perhaps surmounted by the book of supreme wisdom and the sword slicing through ignorance. It was produced in the Kathmandu valley by the Newar people and bears the hallmarks of their art: extreme elegance (nevertheless tempered by a certain stylization), and the inlaid semi-precious stones that reveal the Nepalese taste for lavish ornamentation which was to flourish in the following century. These stones, some of which have disappeared, consist of pieces of glass, lapis lazuli and garnet, and embellish the statuette, executed in extremely pure copper. The quantity of gold present in the metal may have been a votive gift offered to commission the work which was perhaps originally part of a triad composed of a d’un Buddha and two flanking bodhisattvas. 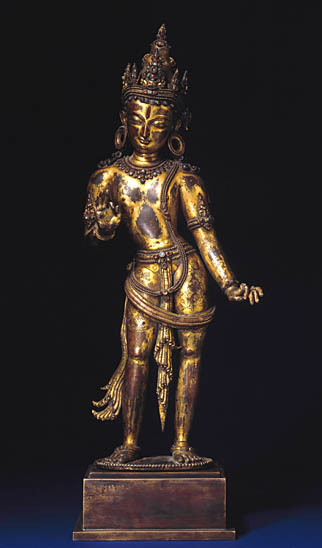 This is an outstanding example of metal statuary from the “Early Malla” period (1200-1482) which marked the heyday of Newar art. The Newar were responsible for the main creations of Nepalese art; its canons were inspired by India which exercised an influence on Himalayan art from the beginning of our era. During the Early Malla period, growing trade with Tibet led to the emergence of an upper social class which displayed generosity to Buddhist foundations and became a major source of patronage.